Ideas to help you write ninja lesson plans your class will love! 1. Safety - Safety is the number one priority when lesson planning for your ninja class. Every piece of equipment should be used properly. Careful consideration is taken to teach how to use the equipment/obstacle and allowing the children to practice with proper technique. Along with using the equipment properly, another huge aspect of safety, is teaching the participants how to fall. 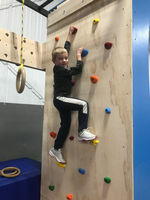 The safety fall is a skill requirement that is taught and practiced in all levels of gymnastics and ninja. 2. Age - When creating any type of lesson plan it is important to consider your audience. The age of your class is one of the biggest factors when creating the perfect plan. Knowing and understanding what is developmentally appropriate for your students is crucial. 3. Challenges - While age plays a factor, and provides you with guidelines of what will be appropriate for most students, no two students are the same. It is necessary to create opportunities to challenge those who need it. Challenges can come from increasing the number of repetitions, changing the distance from one obstacle to another, combining obstacles, or moving through the obstacles faster. The goal, according to Jordan Catapano in his article "Teaching Strategies: The Balance Between Challenge and Frustration" is to find the middle ground between "too easy" and "too hard." 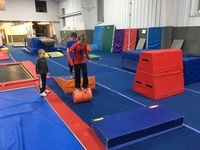 Try out these obstacles in your next ninja lesson plan! 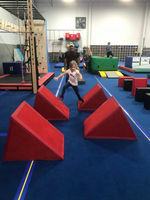 Next time you are creating ninja lesson plans try to incorporate the different types of obstacles listed below.